In an alarming development for India, after a meeting of foreign ministers of China, Pakistan and Afghanistan, in Beijing on Tuesday (Dec 26), Chinese foreign minister Wang said China and Pakistan are willing to find out ways to extend China-Pakistan Economic Corridor (CPEC), the $57 billion project, to Afghanistan. Wang said China hoped the economic corridor could benefit the whole region and act as an impetus for development. Afghanistan has urgent need to develop and improve people’s lives and hopes it can join inter-connectivity initiatives, Wang told reporters, as he announced that Pakistan and Afghanistan had agreed to mend their strained relations. India has looked suspiciously at the project as parts of it run through Pakistan-administered Kashmir that India claims its own territory. 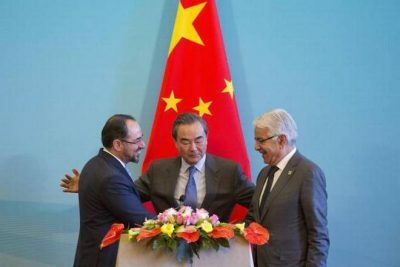 China has sought to bring Kabul and Islamabad together partly due to apparent Chinese fears about the spread of militancy from Pakistan and Afghanistan to the far western Chinese region of Xinjiang, according to Reuters news agency. Hence China has pushed Pakistan and Afghanistan to improve their own ties so they can better tackle the militancy in their respective countries, and has also tried to broker peace talks with Afghan Taliban militants. A tentative talk process collapsed in 2015. The Belt and Road infrastructure drive aims to build a modern-day “Silk Road” connecting China to economies in Southeast and Central Asia by land and the Middle East and Europe by sea. At the same time, to alleviate Indian apprehensions, Chinese foreign ministry spokesperson Hua Chunying said the project extension was not directed at any third country and that it serves the common interests of the three counties. “The trilateral cooperation and dialogue is not directed at any country or any party and the dialogue and cooperation should not be influenced and disturbed,” Hua emphasized. The network of highways, railways, roads and special economic zones is opposed by India as it passes through a part of Kashmir administered by Pakistan and claimed by India. “It is an economic cooperation program and it should not be politicized and has nothing to do with territorial dispute,” she said adding that the project will bring the benefit to the third party and the whole region. “Afghanistan is a common neighbor of China and Pakistan. They have strong desire to develop the economy and improve livelihood. They are willing to integrate into the regional connectivity process and willing to integrate into CPEC,” she said. During the trilateral meeting, a consensus was reached on eight-point plan to bring peace between Afghanistan and Pakistan. The consensus included a security mechanism to enhance counter-terrorism cooperation to fight all forms of terrorist organizations and terrorists, she added. According to Hindustan Times, China has always sought to allay India’s apprehensions about the project, describing it purely as an economic initiative. Beijing also says the project will not affect its neutral stance on the Kashmir issue. India is in a pivotal geographic location for the Silk Road Economic Belt – any major development to get to either Africa (through the Indian Ocean) or central Asia requires India’s input. The potential of a robust Chinese presence on the China-India border or in Pakistan, and a similar such presence in the Indian Ocean, has alarmed the Indian government, China’s main economic rival on the continent. The Belt and Road Initiative, a signature foreign policy priority of Chinese President Xi Jinping, is often referred to as the largest initiative of its kind launched by a single country. It comprises two large segments: the Silk Road Economic Belt, a land route starting in western China that goes through Central Asia and on to the Middle East; and the 21st Century Maritime Silk Road, a maritime route that goes around Southeast Asia, the Persian Gulf, and the Horn of Africa. All in all, it includes more than two thirds of world population and more than one third of global economic output, and could involve Chinese investments that total up to $4 trillion. Meanwhile, a second India-Afghanistan air cargo route linking Kabul to Mumbai was officially launched on Dec. 27, with officials saying it is expected to boost the export of fresh fruits and medicinal plants from Afghanistan. The second route follows the success of the Kabul-New Delhi air corridor that was inaugurated by President Ashraf Ghani in mid-June. Afghan officials told the media that 10,640 tons of fresh produce, fresh and dried fruits, medicinal plants and handicrafts worth more than $20 million had been exported to India since the launch of the first corridor. Second vice president of India, Mohammad Sarwar Danish said the air corridor is very important for the government. “We are hoping that the neighboring countries even consider the economy in their political policy,” he said.